Electronic Arts is giving Medal of Honor a big push but at least one analyst thinks it's at serious risk of getting pounded into oblivion by two of the industry's true FPS heavyweights. Remember the episode when Pinky Tuscadero ended up in the hospital after being hit with a Malachi Crunch while she was crawling across the hood of her stalled car? Yeah, maybe not. But Kaufman Bros. analyst Todd Mitchell says that's pretty much the situation that Medal of Honor could find itself in when it comes out next month: Alone, exposed and caught between two snarling behemoths. 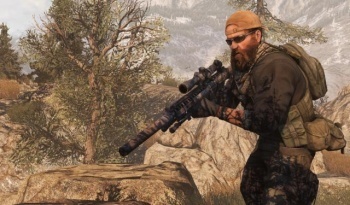 The decision to include the Taliban in the new Medal of Honor has earned significant attention from the press, but that won't necessarily be enough to attract gamers to the title. "We are increasingly concerned about the prospects for Medal of Honor," Mitchell told Gamasutra. "The game is not developing the level of buzz necessary to knock Call of Duty off its perch." Even more dangerous than a failure to bump off Call of Duty, which EA has already acknowledged won't happen this year, is the possibility that the game could be caught in the crossfire between Halo: Reach, which brought in $200 million in first-day sales, and Call of Duty: Black Ops, pre-orders for which are outpacing even those of the hit Modern Warfare 2. Mitchell described the October 12 release of Medal of Honor, a month after Reach and a month before Black Ops, as "ill-timed." "We really don't see a rationale for owning all three of these games," he said. Medal of Honor is being developed by Danger Close for the PC, PlayStation 3 and Xbox 360.